What Foods Should I Eat for Chest Congestion? Chest congestion can make breathing difficult and can cause coughing, shortness of breath and wheezing. Congestion can be caused by allergies or illnesses and can be acute or chronic. Thickened mucus secretions that cause congestion can be treated with over-the-counter or prescription medications and by treating the underlying cause. In addition, certain foods may have an effect on the secretion of mucus by the glands lining your respiratory system. Chest congestion that is accompanied by yellow or green mucus generally indicates the presence of an infection. If you are experiencing significant chest congestion, wheezing, fever or unusual mucus discharge, see your doctor. Water as well as other non-caffeinated fluids can help to thin mucus secretions and ease chest congestion. The Mayo Clinic suggests that you emphasize water, juice and clear broths and avoid soft drinks, coffee, tea and alcohol, which can cause dehydration and make congestion worse. Contrary to popular belief, milk and milk products do not appear to cause additional congestion or increased mucus production, according to the University of Maryland Medical Center. However, despite this myth, milk is more like a food than a beverage and should not be counted as a part of your fluid intake. The traditional remedy for colds, flu and accompanying chest congestion is warm chicken soup. The University of Maryland Medical Center explains that chicken soup may help reduce inflammation that can cause chest congestion or make it worse. 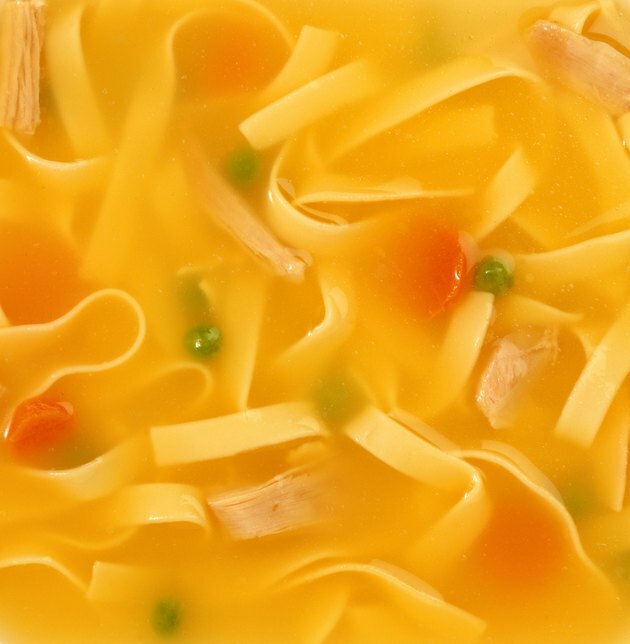 The heat from chicken soup may also help thin mucus and make it easier to expel through coughing. Before consuming chicken soup, hold your head over the cup or bowl, allowing the soothing vapors to reach the sinuses and bronchial tubes. Spicy foods like cayenne pepper and chili powder can help drain clogged sinuses and bronchial tubes. A 2011 research study published in the "Annals of Allergy, Asthma and Immunology" found that nasally administrated capsaicin was effective in decreasing congestion caused by rhinitis. Capsaicin is the active ingredient in cayenne pepper and is widely used to treat pain and inflammation. Consuming spicy foods, particularly those that contain capsaicin, may help relieve congestion in the sinuses that can lead to chest congestion. Vitamin C is an essential nutrient that your body can't produce and must obtain from an outside source. The Linus Pauling Institute at Oregon State University explains that this vitamin may help increase the effectiveness of your immune system. This can help reduce the severity and duration of conditions that cause chest congestion. Foods that are rich in vitamin C also tend to be a natural source of water, which can help reduce the thickness of mucus. Dartmouth College Health Service adds that if you have an upper respiratory condition, you should emphasize fruits that are rich in vitamin C, especially oranges.